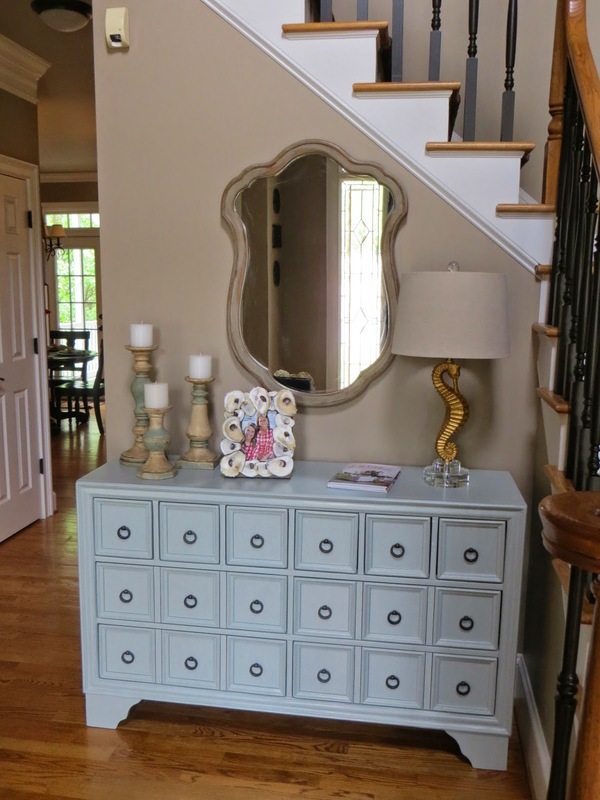 I shared recently the Pottery Barn dresser that I painted with my new favorite Benjamin Moore color, Beach Glass. For the past week or so, I have been on the hunt for a new mirror for the space as well. Well, hubby and I made a trip over to Queen of Hearts Antiques in Alpharetta over the weekend. 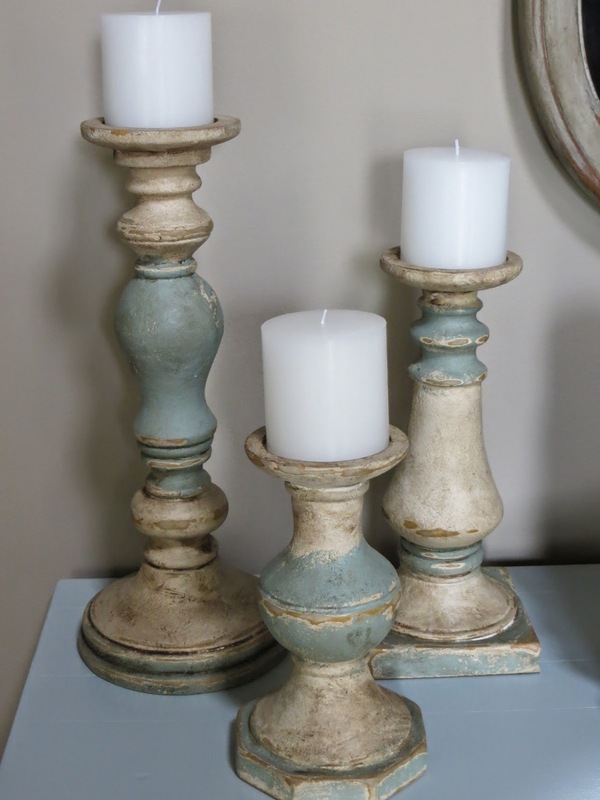 I not only found a fantastic mirror for the space (that in the end I decided not to change one bit once I got it home), but I found a set of three fantastic candlesticks as well. Both, paired with my Seahorse lamp from Home Goods and my oyster shell frame inspired by Amanda of Dixie Delights finished off the space nicely. I still would love to add "something", maybe a few more older books to the mix. But, for now I am happy. After painting with old mirror (it found a home in #2s room). 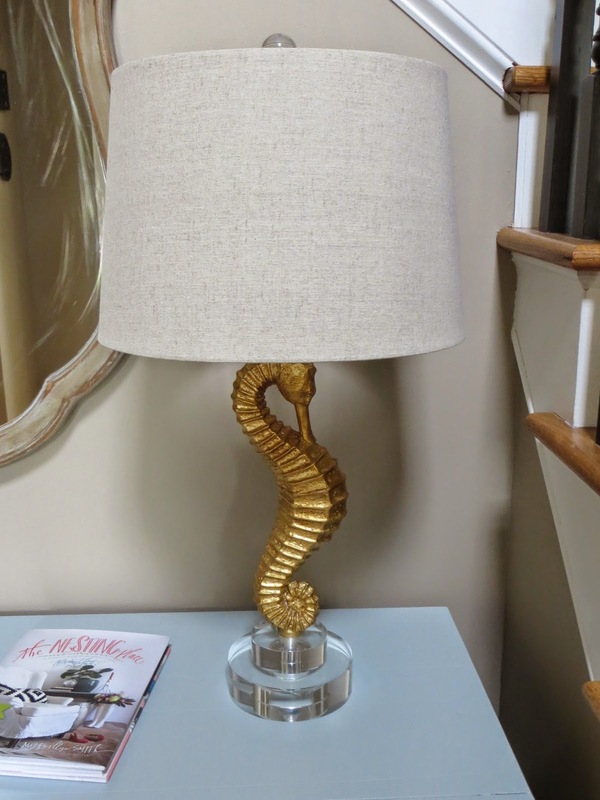 Seahorse lamp, a Home Goods find. 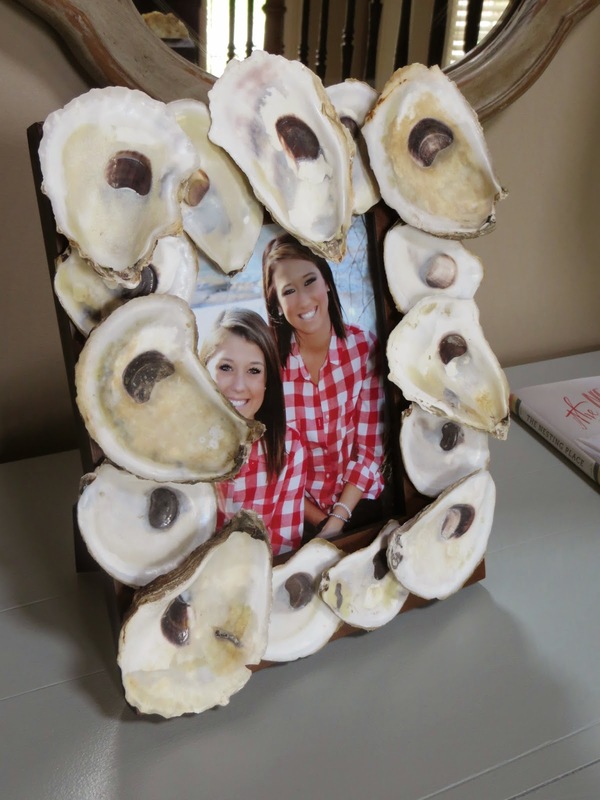 Oyster shell frame inspired by Amanda at Dixie Delights. Candlesticks found at Queen of Hearts Antiques. Love the beachy worn finish. Mirror, also found at Queen of Hearts Antiques. The mirror has some scratches, but I think it adds character. It has a solid wood frame and backing, and appears to be quite old. Another angle from the office entry. I am super excited with how it turned out, and am glad to check it off my list. Continuing to pray for all throughout our region touched by the storms the past few days. We are bracing for round 2 here later today. What was cooking on the weekend? First, I have to say my heart and prayers go out to all who were effected by the deadly tornados that touched down last night. Such devastation. Praying for safety for those in the line of today's storm path as well. We may see some of it late in the night into early tomorrow morning. If you follow me on instagram, you would have caught a glimpse of what was cooking this weekend. 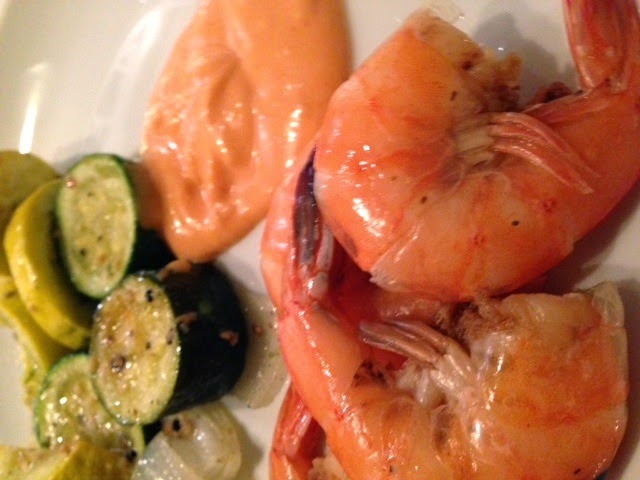 Saturday night, hubby and I boiled some fabulous Florida shrimp we got at Whole Foods. We simply sprinkled them generously with Old Bay seasoning, and let them marinate for a bit. We then boiled them, and roasted some squash and zucchini for our side dish. We made our usual Sriracha Remoulade sauce for dipping. Super simple! After making a trip to the farmer's market on Sunday, we whipped up a bowl of Tequila, Lime & Green Onion Slaw. The recipe is from my new Primal Cravings-Your Favorite Food Made Paleo cookbook. 1. In a large bowl, whisk together mayonaise, green onions, lime juice, tequila and salt. Taste and adjust seasoning, remembering that this should be seasoned relatively assertively because when we add the cabbage, the flavor will dilute (we made it as is and it was perfect). 2. Remove any ugly or damaged outer leaves from the cabbage. Cut the cabbage in half lengthwise. Cut out the fibrous core. Place the cabbage, cut side down, and slice it into very thin strips. 3. Add the cabbage to the mayonaise mixture. Toss to combine. 4. Refrigerate and let marinate at least 30 minutes before serving. Hubby whipped up a marinade for the chicken as well. We cubed the chicken, tossed with the mixture, and marinated for about an hour. He then grilled it on the stove in our Staub grill pan. Both dishes were super simple to prepare, and delicious. The slaw would make a great side for a backyard bbq. Those of you that follow me on instagram know that we had Spicy wings for dinner last night. They were super easy to prepare and tasted delicious. Just the right mix of heat and sweet. Serves: 2 Prep: 15 min. Cook: 35 min. 2. In a small bowl, combine the olive oil, honey, sriracha, coconut aminos and lime juice. 3. In a large bowl, combine the chicken wings, garlic powder, and season with salt and pepper to taste. 4. Arrange chicken wings on a parchment paper covered baking sheet and bake for 25-30 minutes, flipping them over halfway through. 5. Brush the wings with Sriracha mixture and place them under the broiler for 3-4 minutes, or until crisp and crusted (I broiled them about 3 minutes, then flipped and broiled approx. another 2-3 minutes). 6. Serve immediately, garnished with fresh cilantro (we omitted this part since I didn't have any on hand). We served it with a side of Gluten-Free Potato Salad with Fresh Green Beans and Tarragon Dressing. ** If you do not have celiac's or a gluten sensitivity you can use your normal version of the ingredients. 1. Fry bacon until crisp and drain on paper towels. When cool crumble. 2. Slice unpeeled potatoes 1/4 inch thick and boil just until tender, but not soft, about 15 minutes. Drain. While potatoes are boiling, cut green beans into 2-inch pieces and steam for about 7 minutes, or just until tender. 3. Place cooked potatoes, green beans, sliced green onions and parsley in a large bowl. 4. In a medium bowl combine light olive oil, gluten-free chicken broth, tarragon vinegar, minced garlic, dried tarragon, dry mustard, salt and pepper. Whisk until combined. Pour dressing over vegetables and use a large spatula to gently coat vegetables. Add crumbled bacon and combine gently. 5. Serve immediately at room temperature or chill (we made our the day before and had it chilled). A nice twist on the traditional mayonaise based potato salad, and perfect for picnics as it keeps longer. As I mentioned yesterday, the console table in our foyer was not the only one I was having an affair with victim. The mirror above our piano in our library was due for an update. The mirror had been sporting a bronze brown color and I was not thrilled with it against the ebony black of our piano. Sorry for the poor lighting, we are experiencing some more crazy Atlanta weather, 80 Sunday, rainy today, 40-50 tomorrow??? Ugh...I just planted my herbs and veggies. You will notice in the background my new Ahhhmazing oyster sconces custom created by none other than Tery Hodges of Lure Coastal Design (Etsy). Tery is a pleasure to work with and her work is stunning. Will feature a close up soon!!! A huge thank you to Ron, Uptown Acorn for the referral! Will feature my final victim shortly! Bawwwahhhaaaa. No, not that kind of affair...I have been happily married for 25 years (26 in May). No, I have been having an affair with a paint brush. Well, that and my new favorite color...Beach Glass by Benjamin Moore. 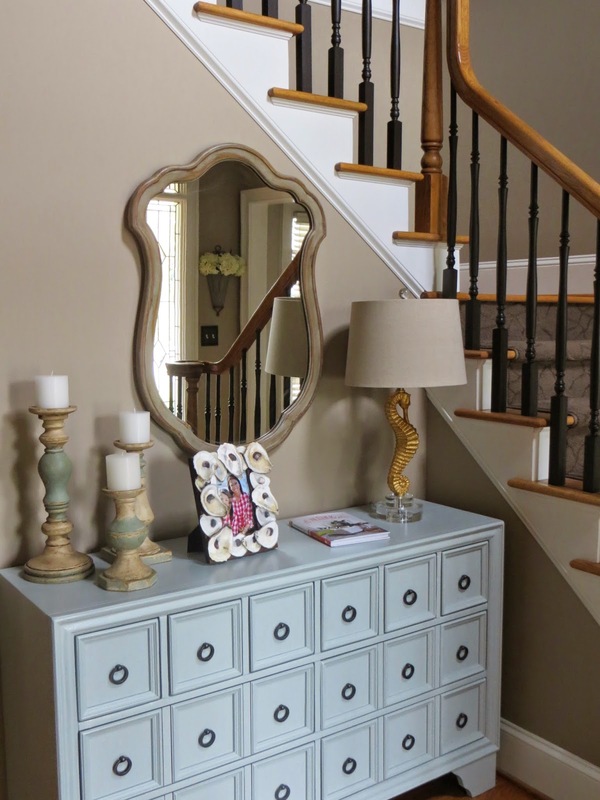 It all started with a console table in our upstairs hallway. It never really quite felt right. It was a bit too modern for our home. So, I decided I would move the one from our downstairs foyer upstairs. Well, that left that space a bit naked! 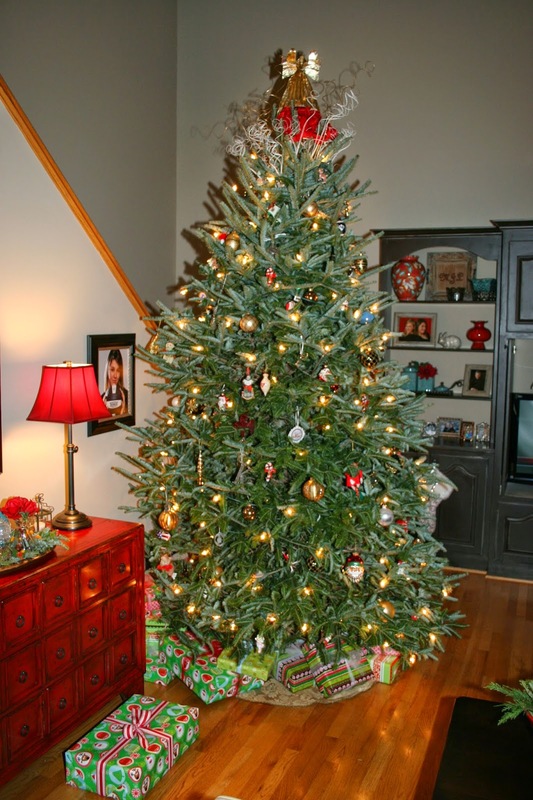 We had a Pottery Barn piece in our basement that used to be in our family room. However, we were no longer fond of the China red color. 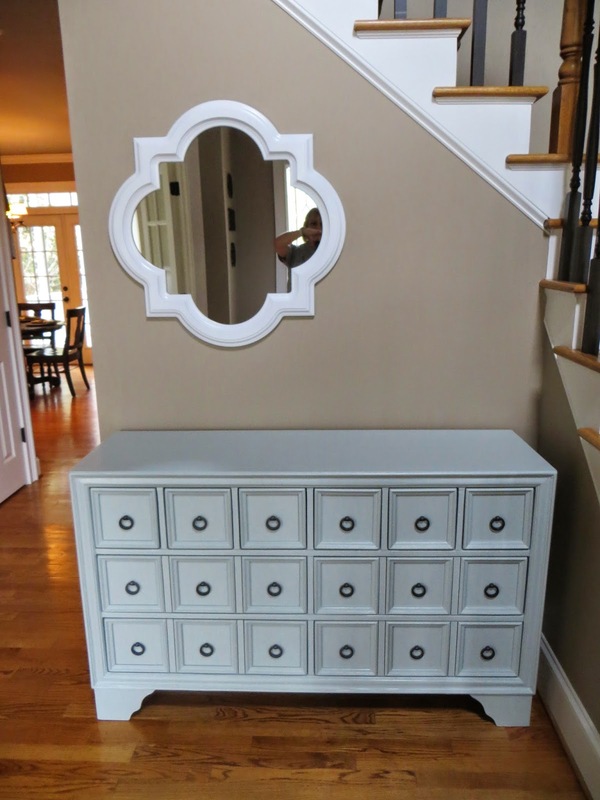 I decided to tackle sanding and painting it so we could use it in our foyer. Of course, when I told my sweet #1 what I was doing she exclaimed, "you are sanding and painting a $$$ Pottery Barn piece...dad is going to kill you!" I informed her dad already knew and thought it was in fact a good idea. LOL Plus, I have learned it is easier to ask for forgiveness after the fact. Sorry, not the best pic of it but you get the idea. The mirror is not staying. It is finding a new home in #2's room shortly (we are redoing her room in a fun Lilly print, once mom's hand recovers from all the painting over the weekend-if you follow me on IG you know the console was not my only victim). Okay...here is where you come in. 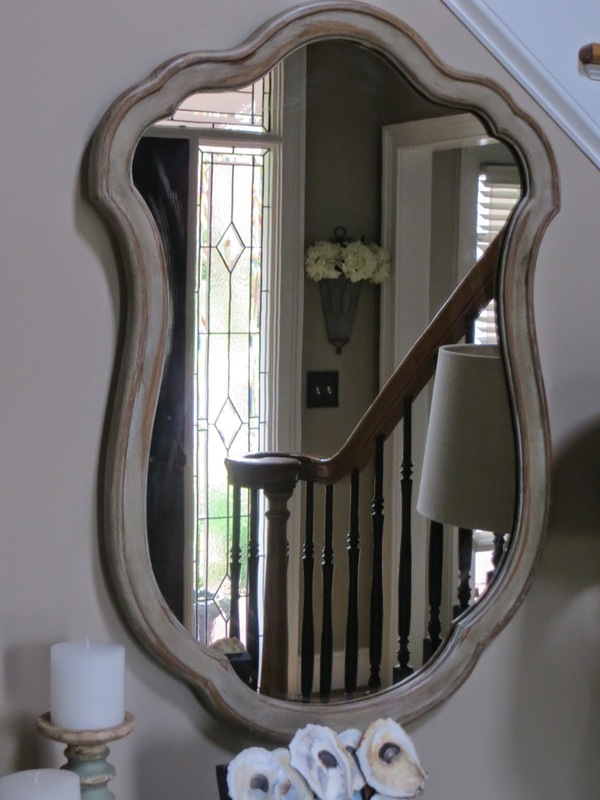 I am having a hard time deciding on the type/shape/color of mirror to replace the current one with. I saw this one at Target and like the fact that it is round, black, a bit distressed with some gold and mimics the handles (colors/shape) on the console. It is just a tad smaller in size then the current mirror. I have thought about something with a bit more detail too, but was it afraid it might be too formal looking. Thoughts??? Am waiting to style the console until I have the mirror in place. Yes, I am still here. Sorry for the lack of posts lately, but I have become intimate with window replacement specialists. No joke! We are at that point in our home's life span that we are in desperate need of replacement windows. This is what I call "a not fun project". Kitchen remodeling, new drapes, new accessories...all fun. Windows, not so much. Slowly but surely, we are narrowing down our options. I am ready to move on to the exterior paint colors...FUN in my book!!! I have truly kept hubby entertained throughout imitating our sales people! To the point we were held hostage in our car in the Home Depot parking lot to AVOID said salesperson who was on his way out to his car. 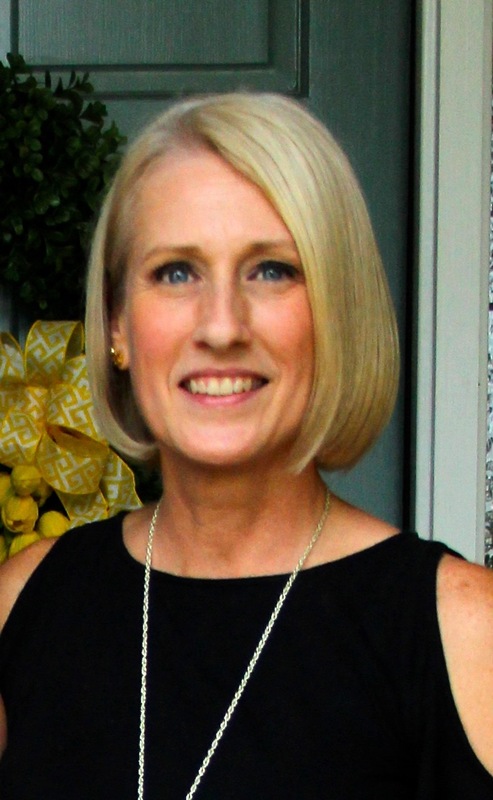 We park, hubby is about to get out of the car when I spot "sleazy, I have no idea what I am talking about, salesperson" coming out of the store..."GET BACK IN, NOW!" Hubby, "huh????" Me, "DO WHAT I SAID!" LOL Me trying to avoid another 3 hours convo with said salesperson learning more than I want to know about his daughter, mother, aunt, uncle...dead grandparents (ok, maybe not, but you get my point). Can't be any simpler. We served it with spinach wilted in garlic butter. Perfect compliment.